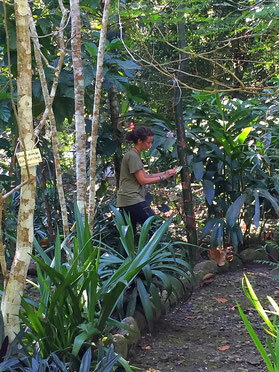 Lea re-planting our Labyrinth of Medicinal Plants. January is a great month to start with this project. We had a great rainy season, 3 months non stop raining, all turned so green and beautiful, trees grew more, we have also more flowers, just perfect. BUT our labyrinth was not as we wanted it to be; too much rain killed some plants, now we have more trees, which are bringing more shade over it, hence less sun... Well.. a whole lot of things to be done here. We knew we had to do something, but there is always something to do around, where to start, what to do, what should I target first. Lea arrived to us, a wonderful french girl volunteering and she said she would like to stay longer and work with medicinal plants. Lea has never worked with medicinal plants and such a work would mean to work side by side with her and invest a lot of time, but she was so great and learned so quick, that we decided to start the project and re-plant the labyrinth. Sometimes one just need a push and inspiration and Lea was it. Now here we are changing things, rewriting, relocating and Lea learning and planting and cleaning and and and. It is a wonderful work and we are happy to meet people along the way who inspire us and give their hand to help us with wonderful projects like this. Its never a matter or motivation, but time. Caoba reflects the hard work with the heart and soul of the people living here and also the volunteers coming by and giving us a hand. 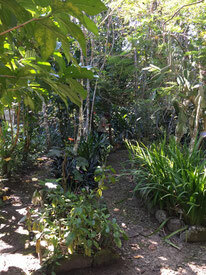 Soon we will have the labyrinth ready and we will start to do tours about medicinal plants. Its an energy boost and a satisfaction to have such small improvements. Found in our Labyrinth. 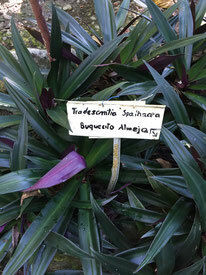 The plant is used agains stomach ache, head ache and cough. Has also other properties. Found in our Labyrinth. This plants is used to treat burn injuries, helps against diabetes, lowers colesterol, helps the digestion and cleans the colon. Dried it has 27% of protein. 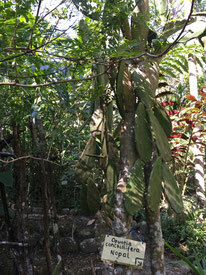 This is only a small example of what the plant is used for, as it has more properties. Please be aware: don't try to use these medicinal plants at home. Only an expert knows the dosage and ways to use the plants for medicinal purposes.